Is there anything equally exciting as shopping? Yes , there is! 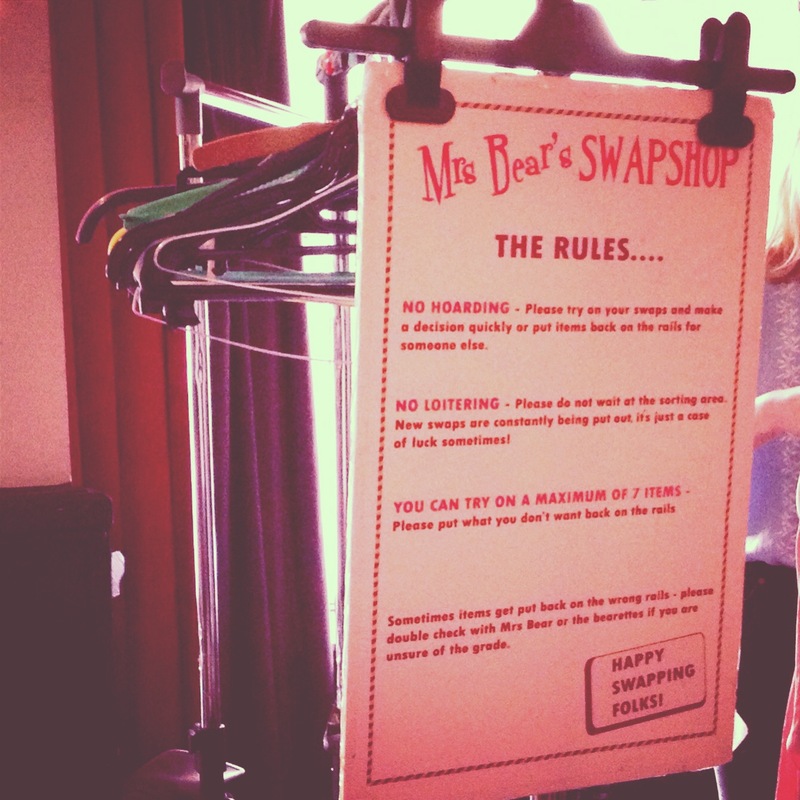 Swapping clothes can be very exciting and less painful when it comes to spending money .Thanks to Mrs Bear’s Clothes Swap Shop me and the other girls were allowed to swap seven items we were bored of for something we love . The event is actually themed on a World War II “make do and mend” ethos ( for more information and pictures about the theme I’d recommend to visit the Imperial War Museum in London). The events are held at various locations in London with a regular once a month slot at The Britannia in Hackney (which is so-called extravagant borough in the east of London) . The place is not easy to find which actually makes it even more sophisticated and mysterious . One negative thing that I’ve noticed was the lack of attendance (probably because of the weather OR the London Fashion Week happening in the centre? ) and that there was no men’s section .The clothes were divided into designer and high street sectors and were all very carefully graded by Mrs and Mr Bear so the people won’t be afraid of getting very damaged or old clothes in exchange for their treasures. The event is happening every one or two months in two different venues. Although the big one in London’s Old Spitalfields Market is said to be much busier and better, the smaller one has a little retro shop feel about it . To sum it up – it was a great experience! It is definitely worth to spend six pounds to get in with your seven pieces of clothing OR accessories not only because you can swap them for something you like but for the purpose of meeting very nice and lovely people and generally having a good time in the venue, too.